Coll. No. 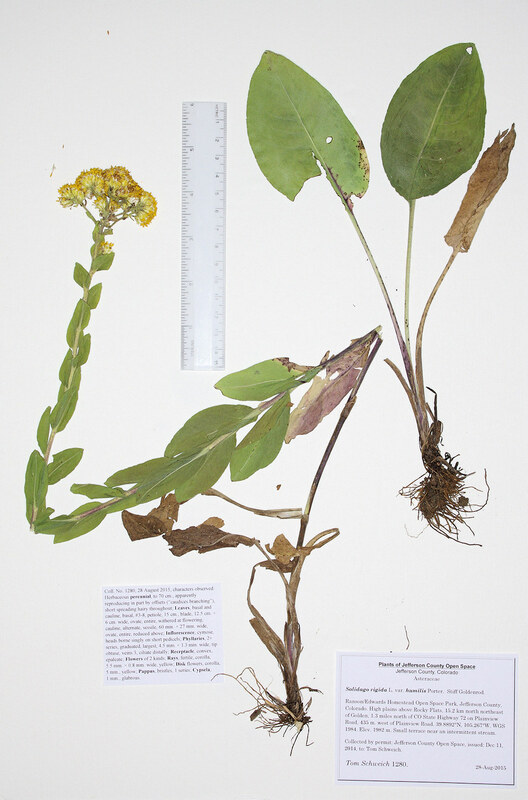 1280, 28 August 2015, characters observed: Herbaceous perennial, to 70 cm., apparently reproducing in part by offsets (“caudices branching”), short spreading hairy throughout; Leaves, basal and cauline, basal, #3-8, petiole, 15 cm., blade, 12.5 cm. × 6 cm. wide, ovate, entire, withered at flowering, cauline, alternate, sessile, 60 mm. × 27 mm. wide, ovate, entire, reduced above; Inflorescence, cymose, heads borne singly on short pedicels; Phyllaries, 2+ series, graduated, largest, 4.5 mm. × 1.3 mm. wide, tip obtuse, veins 3, ciliate distally; Receptacle, convex, epaleate; Flowers of 2 kinds; Rays, fertile, corolla, 5.5 mm. × 0.8 mm. wide, yellow; Disk flowers, corolla, 5 mm., yellow; Pappus, bristles, 1 series; Cypsela, 1 mm., glabrous. Field Notes: Coll. No. 1280, 28 Aug 2015. Other photos about Species - Asteraceae or Solidago rigida humilis.